Sometimes states exaggerate the threat posed by violence from non-state forces. With ISIS in Iraq and Syria, however, the opposite is true: its onward march threatens the region and the international community. 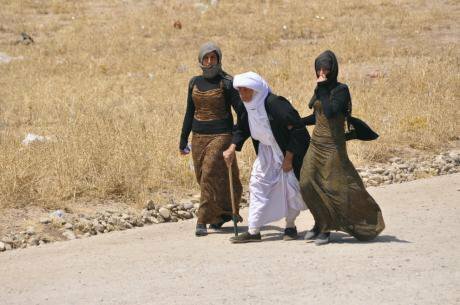 Yazidi women fleeing ISIS—with good reason—this week in Iraq. Domenico / Flickr. Some rights reserved.The rapidity with which the Islamic State in Syria and al-Sham (ISIS, or now just plain Islamic State), an offshoot of al-Qaeda, has spilled over from Syria and moved across Iraq’s north-west frontier has taken many analysts by surprise. This highly nimble force, travelling under its own steam—with only its knives, assault rifles and ammunition in tow—has inflicted lightning defeats on the much larger, cumbersome and poorly-led Iraqi security forces. One factor has been the sheer dehumanising fundamentalism of ISIS fighters. Many troops fled in the face of the advance of the death squads and those who stayed to fight were captured, summarily executed and dumped in mass graves—their principal crime, apparently, being to belong to a different religious sect. The killers ensured their handiwork was transmitted via social media, in videos demonstrating that human beings are still capable of descending in the early 21st century into the inhumanity towards the demonised “Other’ of 1930s Europe. The medieval behaviour of ISIS forces—masculinist too, with its enslavement of women, enforcement of female genital mutilation and forced marriages—has gone beyond even the trademark jihadi fixation with suicide bombing. A second element has been the political exclusion of Iraq’s Sunni community in recent times. It took the US-led coalition almost four years to arrive at the conclusion that protection of the Iraqi population was key to fighting the complex insurgency which sprang up in the wake of its 2003 invasion. Then, Sunni Arabs, feeling marginalised by the Shia-dominated government, transformed their boycott of the political system into a deep-seated insurgency, in a battle of wills aimed at dislodging occupying forces and forcing a political reconfiguration recognising their disaffection with the state. US-led efforts to win over the Sunni tribes and a military “surge” succeeded, however, in countering the insurgency and dramatically reducing violence. By 2010 the Sunnis had returned to the polls, commanding a sizeable vote that saw them emerge as a serious political force. But their hopes were dashed as the prime minister, Nouri al-Maliki, clung to power. Over the next four years Maliki did little to arrest Sunni marginalisation and instead moved Iraq towards a “hybrid” democracy, denying his political opponents a stake in state power, leading to the current crisis. ISIS was able to draw on this well-spring of Sunni disaffection: beneath the mask of terror, we see an army of Sunni tribesmen, former soldiers, psychopathic killers and foreign fighters, who have all answered Abu Bakr al-Baghdadi’s call to build a state on the bones of other Iraqis. But with its fanatical brute force ISIS is not interested in the slow-boil of politics. Rather, it seems intent on establishing a regime resting primarily on bayonets—or, in this case, kitchen knives, swords and the barrel of an AK47—relying on the currency of fear to enforce its writ. A third aspect is the fragmentation of “al-Qaeda central” from which “franchises” such as ISIS arose—and the growing autonomy and assertiveness of the latter. Thirteen years on from the horrific attacks on the US, we still know very little about al-Qaeda and even less about its offshoots. Experts would have us believe that an investment in the “global war on terror” has seen a reduction in attacks on the US or UK homeland—and, to an extent, that is true. In the UK, for instance, 34 serious plots have been foiled since 11 September 2001. The prevention of further attacks on the scale of the al-Qaeda-inspired suicide bombings on the London Underground—with the exception of the shocking murder and decapitation of the soldier Lee Rigby—has indeed made the UK safer. But Islamist violence is not on the run: a quarter of a century after it was founded in the backstreets of Kandahar in Afghanistan and nurtured in the Sudanese bush, the al-Qaeda network is bigger and more deadly than on 9/11. Not only is it undefeated but it has spawned ideological kin in the form of ISIS/IS and Ansar al-Sharia (“Partisans/supporters of Islamic Law”). Into this death zone, the west has responded with the same enthusiasm which saw the UN deploy forces in Bosnia to deliver humanitarian aid to dead people a generation ago. That al-Qaeda has fragmented could be said to be the result of the long years of intelligence work, targeted drone and missile strikes and military interventions. It might even be arguable that a weakened al-Qaeda is down, if not out. But such a prognosis misses the point that al-Qaeda in the strict sense is fast becoming an irrelevance: it no longer holds a monopoly over global jihadism. Take Yemen. Ansar al-Sharia has become the pre-eminent challenger there to al-Qaeda in the Arabian Peninsula. This loose ideological associate seized and held ground in Yemen’s south-east in 2011, imposing a de facto Islamic state of sorts for the best part of a year. It has been on the march in recent months and demonstrated its own descent into barbarism by ambushing a busload of unarmed Yemeni soldiers: 14 troops were beheaded in an attack strikingly similar to those carried out by ISIS in Syria and Iraq. A fourth and final condition of the rise of ISIS has been the paralysis of the international community when it comes to humanitarian intervention. The creeping nihilism strangling Iraq’s great towns and cities, with repression meted out by narrow-minded zealots to religious and cultural minorities, is redolent of the ugly tide of “ethnic cleansing”, crimes against humanity and genocide which accompanied the “new wars” of the 1990s, as in former Yugoslavia—when crime and identity politics intersected with state repression, non-state terror and humanitarian crises. Into this death zone, the west has responded with the same enthusiasm which saw the UN deploy forces in Bosnia to deliver humanitarian aid to dead people a generation ago. Ordinary citizens do not care about the chatter of “political solutions” when they are being exterminated by death squads: they want protection, shelter and a square meal. There is no difference in this regard between ISIS and the Einsatzgruppen busily at work on the Eastern Front in 1942 or the rounding up and disappearing of individual “dissidents” by the Allianza Anticommunista Argentina during the reign of terror of the right-wing junta in the 1970s, except that they were agents of a state. Although right-wing and fascistic in its orientation, ISIS is not quite there yet. Even if it boasts of popular support inside its exclusively Sunni “caliphate”, no recognition will be conferred upon it by really-existing states—crucially, even, among those that pursue a form of Islamist fundamentalism, whether Sunni or Shia. To do so would undermine the raison d’être of the whole international system. The pusillanimousness of the “international community” is thus all the more questionable. Here some self-criticism by the international left is in order. Its current narrow focus on Israel’s military operations in Gaza, and associated potential war crimes from both sides, has militated against a broader perspective on the barbarism sweeping the Middle East as a whole. Ineffectual common cause with the Palestinian repressed is then exchanged for mere token criticism of the international system. Iraqis are caught up in a Hobbesian nightmare. But such humanitarian responses as there have been—like the only partially effective aid drops on Mount Sinjar—are bound to fall short if they are not accompanied by the hard edge of armed force to protect the people most at risk from the theocratic death drive raging through Iraq and Syria. There is some evidence that a limited number of ground troops have been inserted to provide security of sorts. To permit the coalescence of a non-state actor into a consolidated position straddling two states would be to betray the rules and norms upon which the entire international system is based. The international community must get over its crisis of confidence in relation to intervention for humanitarian reasons. After all, the invasion of Iraq in 2003 was primarily aimed at purported weapons of mass destruction and “regime change”—humanitarian motivation running a distant third. Non-state actors are well aware of the west's aversion to “boots on the ground” in the Middle East—as the growth of Ansar al-Sharia in Yemen, Libya and elsewhere attests—and are exploiting this for all it is worth. Deploying “advisers” to stiffen the backbone of the Iraqi security forces, alongside bombing ISIS positions, is a crucial but short-term step. A long-term solution however depends on a recognition that this is not solely an Iraqi or a “western” problem: it is a challenge for the Middle East as a region and to the international community as a whole.